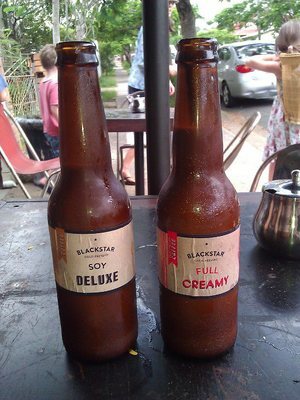 BlackStar Coffee roasts its' own coffee beans and packs a home brew cold-pressed iced coffee in the fridge. I get the feeling it's popular for these two reasons. It comes in "Full Creamy", "Black" and to my delight, "Soy Deluxe". They can also be purchased in funky take-home cardboard six-packs, which go well with the 'beer-esque' brown bottles. What's more, it's not a sugary iced beverage like many adorned with syrups or ice cream – it's just BlackStar coffee, milk (or no milk), agave syrup and vanilla extract. So, thumbs up on the home brew, on all fronts. The cafe seems to be a bit of a West End hot spot – although I've heard (and once experienced) that food is sometimes not available, because they've just run out. Perhaps they like to focus on the amazing coffee, or perhaps the food is darn good and runs out the door? Nevertheless, there's a range of sweet treats available at the counter – muffins, almond croissants and the like as well as a breakfast and lunch menu. Breakfast is from 7am to 11am and includes eggs benedict and tasty sounding muesli among others. Lunch is from midday to 4pm and offers bruschetta, burgers and sandwiches. Of course, you can order hot beverages too, as well as a range of organic cold drinks. Seating is outdoor, but with umbrellas in case you rock up when it's raining like I did – take your pick of a cosy looking lounge with a coffee table, or tables with rustic chairs. 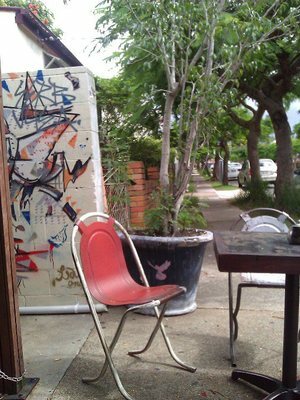 Artwork is splashed along a white brick wall towards the back of the cafe where a lone table is huddled in the corner, perfect for reading. Why? Home brew iced coffee and signature BlackStar coffee bean blend. Cost: $5 for a home brew iced coffee. I take home Blackstar's ground Ethiopian Yirgacheffe for my plunger. Fabulous!